If you are looking to experience a new and different side of Barcelona, we suggest exploring the charming neighborhood of Gràcia in Barcelona. Although it is known for its small town feel, you’ll find that this Catalan ‘barrio’ is host to a large array of exotic tastes, peculiar shops, exciting nightlife, and some of Antonio Gaudi’s masterpieces. Regardless your particular interests, Gràcia’s refreshing change of pace is sure to spark your senses. Before the creation of one of the largest and most expensive streets in the city, Passeig de Gràcia, the only path which connected the quaint town of Gràcia to the center of Barcelona was a small dirt road. Not until the late 1800’s did Gràcia become more accessible to city goers, and thus, more than just a small village on the outskirts. Although Gràcia was annexed to Barcelona in 1897, it is undeniable that the town is influenced by an authentic Catalan culture. Nowadays, Gràcia continues to build its long-earned reputation as a vibrant, artistic and eclectic neighborhood. Just take a stroll down Carrer Verdi and you’re sure to grow an appreciation for Gràcia’s traditional yet trendy vibes. 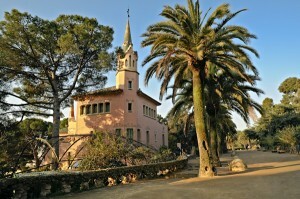 Park Güell – Not only is Park Güell one of Gràcia’s most visited sights, it’s also one of Barcelona’s most popular attractions. Created by world-famous architect, Antonio Gaudí, Park Güell was initially created to provide a residential area for the Barcelona elite. Today, Gaudí’s masterpiece offers the public a panoramic view of the city along with breathtaking architecture that alone is worth the visit to Gràcia. 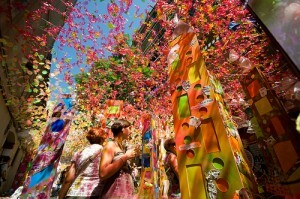 Festa Major de Gràcia – Originally celebrated by Gràcia residents only, today, the Festa Major de Gràcia has built up a reputation of fun and excitement for a much wider audience. Every year during the week of August 15th, the streets in the district of Gràcia are filled with locals and visitors alike, and are adorned with colorful homemade decorations. With a range of activities available for all ages, this festival is a must-see if you find yourself near the area in August. Casa Vicens – Although this UNESCO World Heritage Site is often overshadowed by Gaudí’s more famous works across the city, Casa Vicens (C/ Carolines, 18) provides a detailed look at one of the Catalan-born architect’s most important designs. This beautiful home was built between 1883 and 1889 for Manuel Vicens, a well known industrialist, and while the interior isn’t open to the public, it’s worth a visit just to see the bright facades and intricate designs of the exterior of this unusual house. Cines Verdi – For all the film buffs out there, the Cines Verdi (C/ de Verdi, 26) is the perfect spot to enjoy a movie on the big screen. Cines Verdi is especially enticing as the multi-screen cinema features every film in their original language with no dubbing. With all the exceptional restaurants that can be found in Barcelona, it’s sometimes difficult for good places to eat to stand out. That being said, Gràcia may well be an exception to the trend. 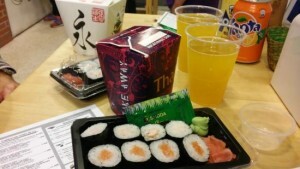 Offering a fantastic range of various cuisines, Gràcia is sure to satisfy even the most particular craving. For a taste of some delicious Catalan recipes, check out Roig Robí (C/ Tordera, 62), where quality meets an authentic atmosphere for an enjoyable dining experience. If you’re in the mood for some delectable Asian grub, head to Asia amb Gràcia (Plaça Diamant, 5), a trendy Chinese-run ‘wok’ joint. And finally, if you find yourself part of a larger group, we suggest heading to La Caleta de Gràcia (C/ del Torrent de l’Olla, 121), which is particularly skilled at accommodating large parties. Although downtown Barcelona has become world renowned for its outstanding nightlife, the district of Gràcia is no stranger to the concept of “a night on the town”. For an exhilarating bar or club experience which doesn’t sacrifice that authentic local feel, take a stroll through the streets of Gràcia. One bar worth visiting is Calexico (C/del Torrent de l’Olla, 141), a bustling nightlife hotspot with quality music. For a more relaxed atmosphere, we suggest you check out Bo (Plaça de Rius i Taulet, 11) which is an ideal spot to grab some quality tapas and kick back with your beverage of choice after a long day of exploring the city. Keeping with the theme of originality and authenticity, Gràcia is a wonderful place to come to shop if you’re after some labels outside the mainstream. 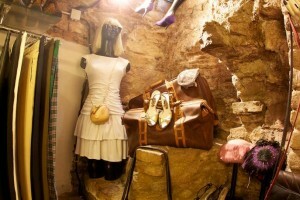 In a town like Gràcia, it would be nearly impossible to turn a street corner and not find another shopping gem. From small vintage shops to large eclectic boutiques, exploring the town goes hand in hand with discovering new and interesting styles. 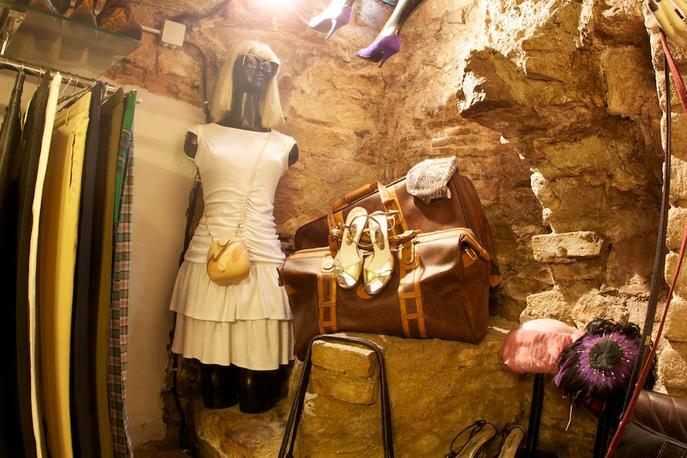 For quality vintage threads, head to Retro City on Travessera de Gràcia where an array of accessories, shoes and style are sure to strike your fancy. If you value your appearance and your wallet, then check out Philo on C/ del Pendes. This chic boutique is sure to offer some of the hottest styles that won’t break your bank. Gràcia’s numerous local squares or ‘Plaças’ set the scene for many enjoyable activities under the sun. Escape from your everyday routine under a shaded tree, grab a beer and some tapas with your friends, or simply relax with your favorite book and catch some rays. Plaça del Sol – Existing as the most central square in Gràcia, Plaça del Sol is a trendy spot with local musicians and street artists performing daily. We suggest grabbing a refreshing beverage from one of the many terrace cafés and enjoying the beats of some live music. Plaça de la Vila de Gràcia – With the help of the striking clock tower nearby, Plaça de la Vila de Gràcia is an easily identifiable meeting place. This area is the perfect spot to take your family and enjoy a bite to eat while avoiding the midday sun. Plaza de la Virreina – With the church of Sant Joan at its center, this neighborhood hosts an array of culture and activity. Visit the square on Sundays to wander the market which offers second-hand trinkets of every sort. There’s no denying the abundance of culture ripe for the observing while wandering the quaint town of Gràcia. Whether you’re in search of peculiar styles, exquisite cuisine, famous landmarks, or a bit of everything, Gràcia provides an enjoyable environment with a unique local twist. If a short visit doesn’t allow you enough time to discover all that Gràcia has to offer, why not stay in one of the many Barcelona apartments in Gràcia where you’ll have the Catalan-bohemian vibes of this lovely ‘barrio’ right on your doorstep. This entry was posted in Home, Neighborhoods, Places, Tourist Guide and tagged areas in barcelona, barcelona, Barcelona accommodation, barcelona apartments, barcelona attractions, Barcelona culture, barcelona events, Barcelona festival, barcelona festivals, Barcelona food, barcelona food and drink, barcelona music, barcelona neighborhoods, barcelona nightlife, catalan culture, Gaudi, shopping in Barcelona, tourism in barcelona, travelling around barcelona, visiting barcelona. Bookmark the permalink.